Keyboards, digital notepads, laptop computers and smart phones, can't replace this. A pen or pencil, scratching the details onto a piece of paper. 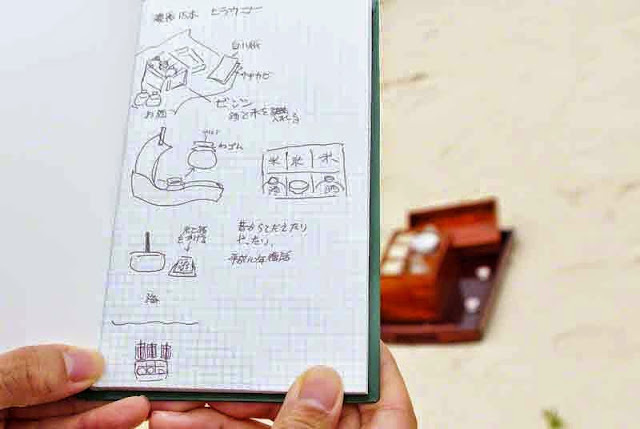 At a cultural event, I noticed Haruka Nakama, writing in her notebook. This was too good to pass up so, I asked if, I could photograph her notes and, she agreed. She was documenting Abushibare, an occasion which takes place only once a year. Things move along rather quickly at these affairs. It was impressive, the detailed sketches and notes, she had made. Understanding Japanese, isn't required, to see what her notes reveal. The placement of each item used in the rituals and, sequence of events was documented. She left room to write down any questions, she may have, to ask guests at the ceremony. It's something, I have been meaning to write about and, now, have a photo for demonstration. 1. Outdoors, touch screens and LCDs are sometimes difficult to view. 2. Notepads and pens fit in pockets. 3. No battery packs or charging systems are required. 4. Hand writing notes is more effective than typing them on a keyboard. 5. Communicating in remote locations or, with elderly is easier, using a pen and paper. Many people are frightened by high-tech gadgetry !